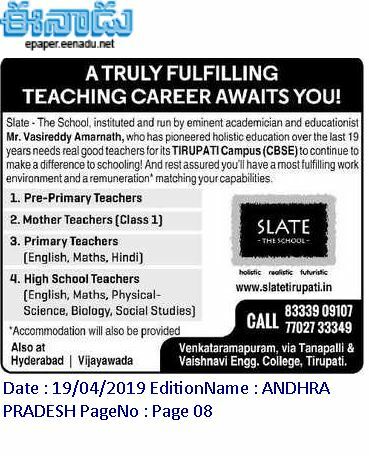 Slate The School Notification 2019 for Teachers Jobs. interview as early as possible in Slate The School Teachers Jobs of Tirupati Campus. 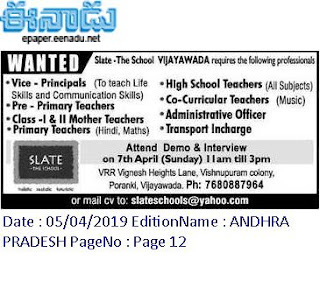 Interview slot is 11 A:M to 3 P:M. Age limit, vacancy details, educational qualification,how to apply, selection process, important dates Slate The School Tirupati Jobs are given below. Interview Date is as early as possible. Vice-Principals for to teach the Life Skills and Communication Skills. Mother Teachers: Class-I & II. Attend the walk in interview at Slate Tirupati campus along with all required documents. Via Tanapalli & vaishnavai Eng College, Tirupati. Eligible candidates can attend the interview and Demo on 07-04-2019 or Updated Resume to send College Email-id to given below. Interview slot is 11 A:M to 3 P:M.